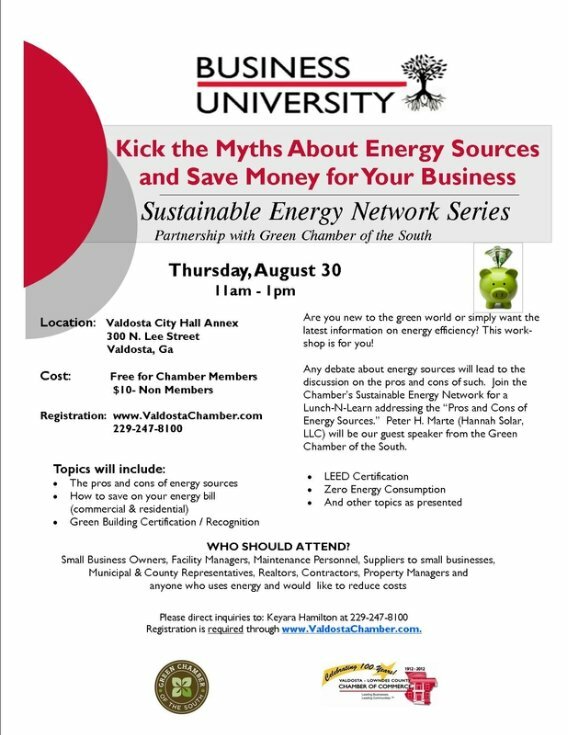 Join the Chamber's Sustainability Network for an informative lunch-n-learn on Thursday, August 30 at 11:00am at the Valdosta City Hall Annex. As you know, any debate about renewable energy sources leads to discussion of its pros and cons. At the upcoming workshop, you will leave knowing more about the pros and cons of energy sources and simple changes that can be made in your workplace, home or office to reduce energy consumption and your monthly costs. Yes, you are encouraged to share your questions and concerns at this informative workshop. Click here to register by Tuesday, August 28. Free for all Chamber Members. Please direct all inquiries to Keyara Hamilton at 229-247-8100.